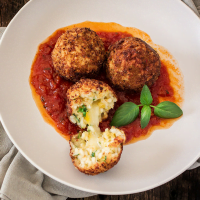 Cheesy fried risotto balls served on a bed of delicious marinara sauce? Yes, please! I hope you guys are not sick of my Italian phase, because I still have sooooo many Italian recipes to share. Especially now that the holidays are fast approaching and we all need a few good Italian recipes up our sleeves to impress our guests. But guys… Is it me, or is the time passing at bullet train speed? ??? And then I would proceed to turn off all my electronic devices and go watch the sunset while eating my delicious arancini balls, without any rush. Doesn’t it sound like a dream? I think that’s why I’m such a fan of Italian cuisine. Nothing is rushed with the Italians. It is all about the slow simmering, the friends around the table enjoying amazing food, the 3 hour long operas… Oh how I wish I had time to go to the opera! I think this is definitely a sign we need to press pause. Stop and smell the roses, ya know? Go for long walks at the beach. Ok, we don’t have the beach near by, but you get the concept, right? One thing I know I’ll do once I have more time for myself (and for my family) is to serve more appetizers. Nowadays I only make appetizers if I’m hosting a dinner party. But life is too short to wait for perfect occasions to eat our favorite foods, so appetizers need to happen every.single.day! 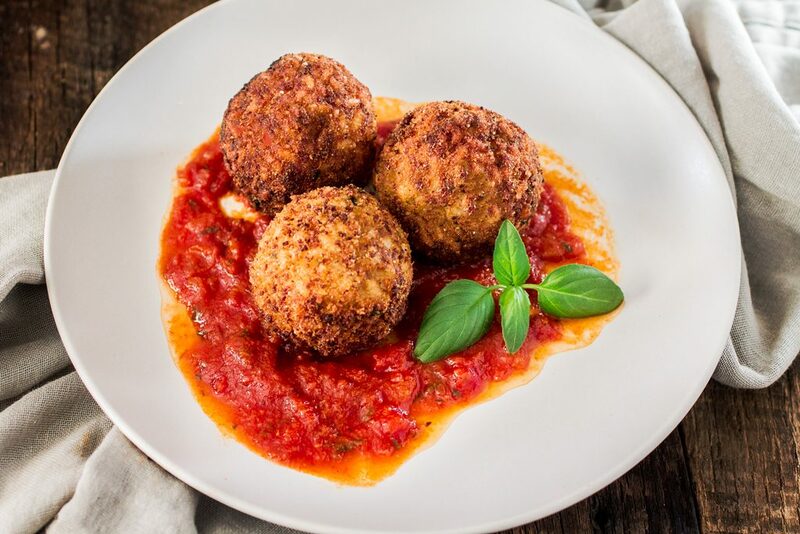 Otherwise, how long would I have to wait to eat these insanely delicious Arancini di Riso with Balsamic Vinegar and Caramelized Onions Marinara Sauce? No no no! No waiting. The time is NOW! And I want all of these risotto balls in mah belly immediately. Arancini di riso means “little oranges of rice” in Italian. They are little balls made of risotto, stuffed with cheese (or beef, prosciutto, veggies, mushrooms, etc), coated with breadcrumbs and fried. They make the most perfect antipasto and are said to have originated in Sicily in the 10th century. 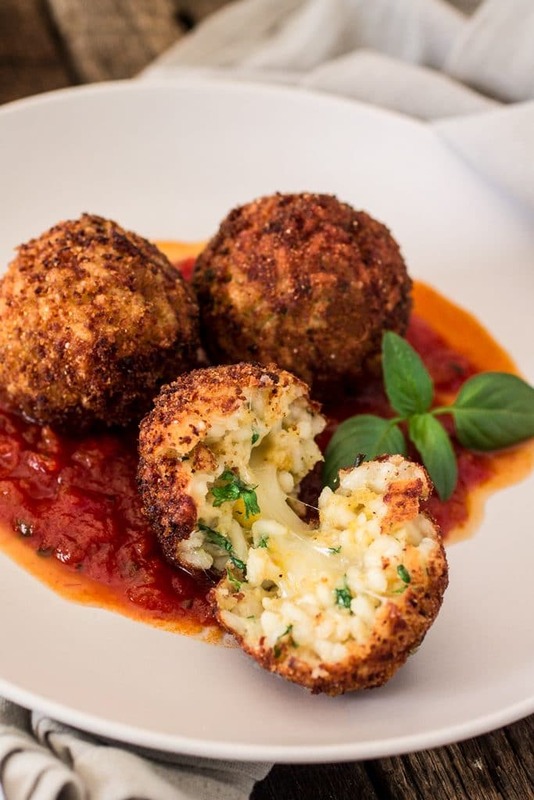 In Palermo and Trapani, arancini are a traditional food for the feast of Santa Lucia, which happens in December 13th, that commemorates the arrival of a grain supply ship on Santa Lucia’s day in 1646, relieving a severe famine. There are a number of variations on arancini balls, differing both in filing and shape, but I chose to make a simple version, stuffed with Fontina cheese, because I wanted to go bold with the marinara sauce! 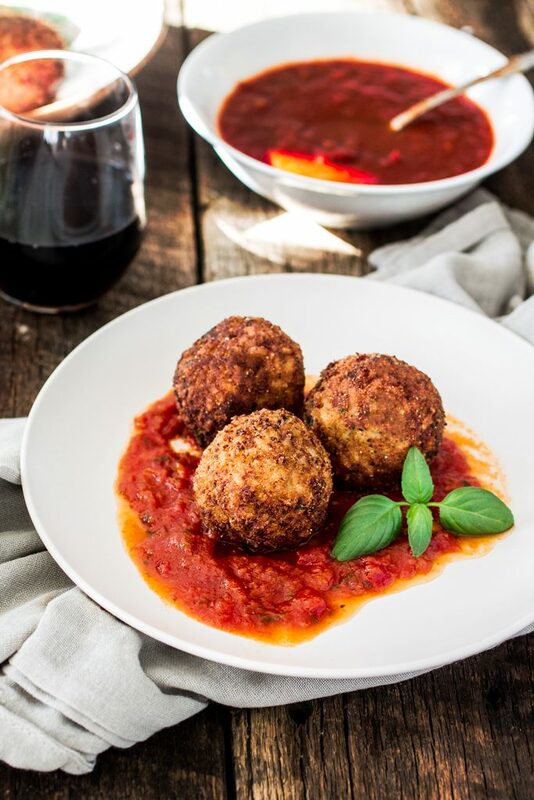 When Bertolli invited me to participate in their “My Tuscan Table” campaign, I knew immediately that I wanted to make arancini balls to dip into their amazing sauce. True, arancini are a Sicilian dish, but they are an Italian staple, and I was confident you guys wouldn’t judge me. Especially after tasting one of these little babies! And the sauce… OMG, the sauce! It truly elevates this dish and your guests will be licking their plates clean, even after the arancini are gone. What else would you expect from a Bertolli product? These guys have been making amazing Italian food for over 150 years now! In 1865, Francesco Bertolli began selling his olive oil in the small town of Lucca, Italy. He opened a small storefront business selling regional foods such as olive oil, wine, cheese and olives. Later, during the late 1800s, Italian immigrants in America, unable to find the products to which they were accustomed, wrote to Bertolli asking for crates of his delicious olive oil. In reply, Bertolli sent orders to America and thus became the first exporter of olive oil. Eventually he expanded the business to also include a broad range of Italian-inspired pasta sauce and skillet meals. I think it’s in order that we celebrate Bertolli’s 150 years of delicious food, friends and family. To help us celebrate, the lovely peeps at Bertolli came up with 150 tips to bring Tuscany to our tables, across the categories of Italian Essentials, prep skills, meal inspiration, Tuscan touch and Bertolli Story. What about you? How are you bringing Tuscany to your table today? Whatever it is, don’t forget to share it on social media to help Bertolli end childhood hunger in America. They are partnering up with No Kid Hungry and for each photo shared via social media using #MyTuscanTable throughout October, they will make a $1 donation to provide 10 healthy meals to kids in need. ❤️ I say it’s a pretty damn good excuse to cook a lot of Italian food during this month and take a bunch of mouth watering pics to make your friends jealous! In a small saucepan, bring the chicken broth to a simmer. Keep it warm and simmering until ready to use. In a large sauté pan, over medium heat, heat the olive oil and sauté the shallots and garlic until tender, about 3 minutes. Add the arborio rice and let it fry with the shallots and garlic for a minute. Add the wine and cook, stirring frequently, until the liquid is absorbed. Start adding the broth, 1/2 cup at a time, stirring frequently and waiting until it is completely absorbed before adding more. This will probably take about 30 minutes. Once the last of the broth is added and the risotto is cooked al dente, remove from heat, add the parmesan and season with salt and pepper. Add the cold butter and stir vigorously until the butter and the cheese melts, being careful not to break the rice grains. Wait for the risotto to cool before making the arancini balls. Add the egg, the 1/2 cup breadcrumbs and the parsley to the cooled risotto. Shape the mixture into twelve 1 1/2-inch balls. Press your finger into the center of each ball and insert the Fontina cheese cube. Then, pinch the risotto mixture around the filling to enclose, adding a little more if necessary. Add the remaining breadcrumbs to a shallow bowl. Roll each risotto ball in the breadcrumbs and place on a parchment paper lined baking sheet. Loosely cover and refrigerate for 1 hour. In a heavy bottomed pot, heat enough vegetable oil to cover the balls, over medium heat until a deep fry thermometer registers 350 degrees F.
Fry the arancini, working in batches, until golden brown on all sides, about 4 minutes. Be careful so the oil doesn't get too hot or the balls will burn on the outside and the cheese won't melt! Remove the balls with a slotted spoon and drain on paper towels. If desired, heat the marinara sauce so it's warm for serving. 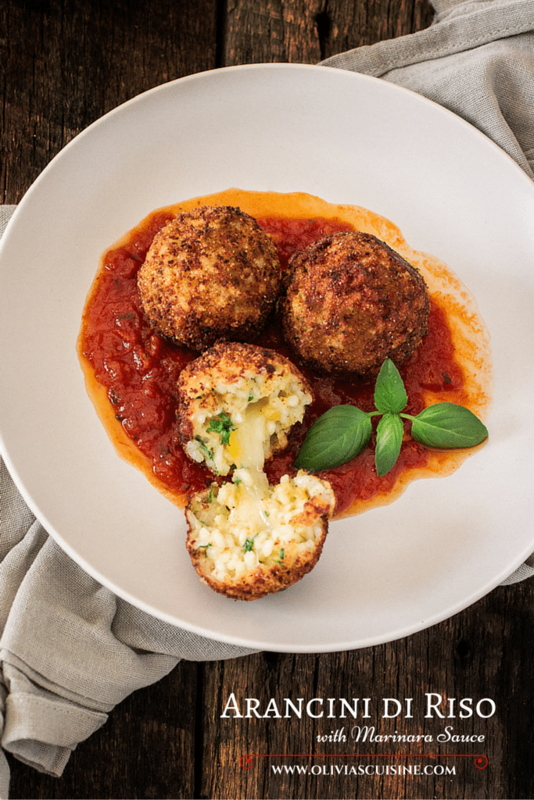 Serve the hot arancini balls with the marinara sauce dip! Wow! These look delicious! I have never heard of these before and now I’m going to have to try them for sure! Your photos are absolutely lovely, by the way! Great post Olivia! These arancini look fantastic! I would love to live like an Italian, but unfortunately my every day life is rushed :) Great dish, can’t wait to try it! Pinned! Girl, I never get tired of Italian food. I love that you used fontina in these risotto delights and I happened to have just picked up some chiani at a winery in the mountains this weekend! I’ve been so happy when I saw that we still have Bertolli products here in Brazil! Now, I’ll look for this specific sauce and I’ll make this wonderful recipe! Hi Olivia, I just discovered your recipe for Arancini di Riso, which by the way, looks absolutely delicious, I can’t wait to try! I also read your blog…you are like a splash of sunshine! Thanks for sharing your life and your wonderful recipes. Thanks so much for stopping by! I hope you enjoy the arancini. They are very addicting!